Chris Nell wasn’t sure what to expect this season. Once he started to adjust to college hockey and earned an opportunity to play in games, his goaltending began to flourish. The Bowling Green freshman is third in the country with a .945 save percentage and fourth with a 1.65 goals-against average. Entering this weekend’s home series against the University of Alaska, he hasn’t lost. He’s 5-0-1 in six games, helping the Falcons to records of 12-3-3 overall and 8-1-1 in the Western Collegiate Hockey Association. The BG-Alaska series is Friday and Saturday nights at 7:07 in the Ice Arena. 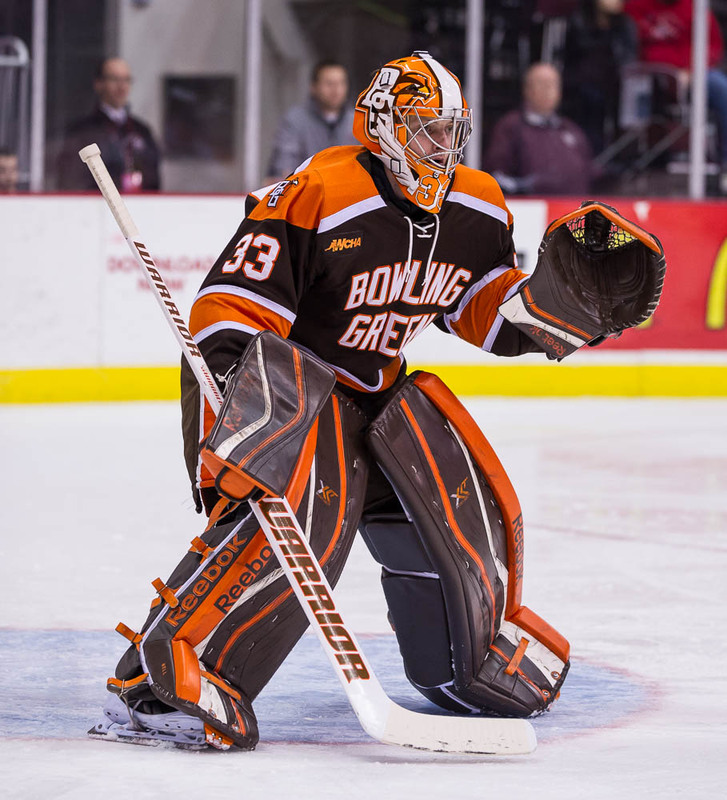 The addition of Nell gave BG three goalies as he joined junior Tommy Burke and sophomore Tomas Sholl. It would have been reasonable to assume Nell would be the No. 3 goalie, while adjusting to college hockey and college life. Perhaps, he’d play in a handful of games and serve as the backup in others. Prior to the season, BG coach Chris Bergeron said each goalie would start twice during BG’s first six games, and Nell won both of his starts. His debut was a 20-save shutout at Alabama-Huntsville Oct. 17. Eight days later, he had 30 saves in a 5-4 win at Clarkson. Although the Falcons’ goaltending derby remains in full swing, Nell has started once in each of BG’s last four series. Burke has played well, and Sholl stopped 34 shots Sunday in a 4-1 win at Robert Morris in his first start since Oct. 31. The 6-foot-1, 178-pound Nell finally qualified for the NCAA and WCHA statistical leaders after making 34 saves Saturday in a 2-2 against Robert Morris at Toledo’s Fifth Third Field. Goalies must play at least a third of their team’s minutes to qualify. Nell had one other shutout, making 26 saves Dec. 6 in a 5-0 win at Northern Michigan. Nell, Burke and Sholl push each other to improve in practice each day. The three are friends off the ice. “They’ve helped me a long the way, and they’ve led me through the first part of the season,” Nell said. “They’re great guys to look up to, and with the help of the coaching staff, I’ve been able to come in and play. Against Clarkson, the Golden Knights scored three straight goals to close within 5-4 in the third period, but Nell’s 13 saves in the third period helped BG preserve the lead. “I started feeling comfortable after the Clarkson game.” Nell said. “It was kind of a bumpy game towards the end, but being able to battle through that, that’s what helped. Nell came to BG after two seasons with the Chicago Steel in the United States (Junior) Hockey League. “The early practices definitely were a struggle,” Nell said. “All of the shots were a lot harder, and I was getting frustrated not being able to make that many saves right away. Nell played three seasons of high school hockey at Notre Dame Academy in his hometown of Green Bay, Wis., before going to the USHL as a high school senior. He had a 1.58 goals-against and a .923 save percentage in 30 games in his final season at ND. Nell had a difficult adjustment in his first season in the USHL, his first away from home. He turned 18 in September that fall. “I was going away to school where you don’t know anyone … I missed close to 50 days of school that year and you’re always on the road for hockey,” Nell said. “That was a big transition in my life. 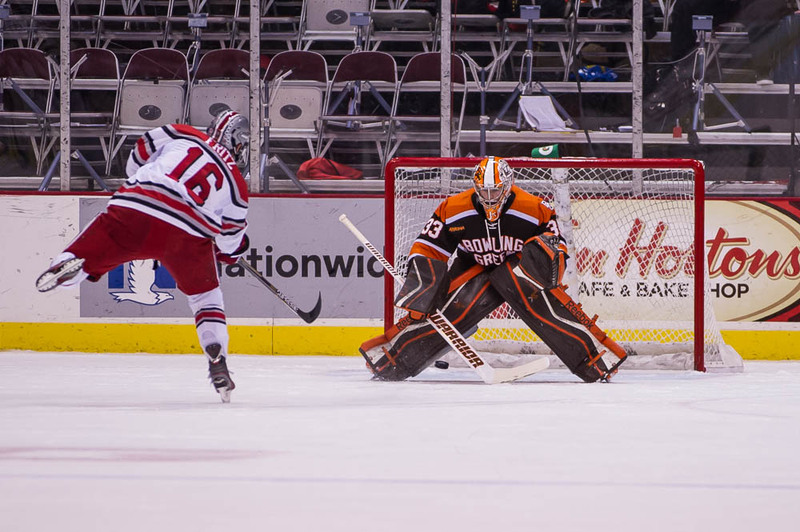 Nell was the Steel’s backup goalie during the 2012-13 season, posting a 3.46 goals-against and .894 save percentage in 25 games — statistics that were far from impressive. Yet, Nell’s play still caught the eye of the Falcon coaching staff that season. He committed to the Falcons in February 2013. “Chris is an athlete,” Bergeron said. “We saw some physical things that were a great starting point, and then to hear how he’s wired and what his approach is every day, both on and off the ice, you take a chance on a person, a young guy, and that’s what it was. Nell was Chicago’s No. 1 goalie last season with a 3.18 goals-against and a .910 save percentage in 43 games. Although Nell committed to BG in February 2013, he could have waited until last season to make his college choice. He just turned 20 in September. BG was one of the only schools to show interest in Nell. Now, he’s sharing the No. 1 goaltending spot on a team that is ranked 11th nationally and contending for a league championship barely halfway through his first season of college hockey. He’s majoring in business and had a 3.25 grade-point average during the fall semester. He hasn’t decided on what specialty he will pursue, but he’s considering marketing with a minor in finance.